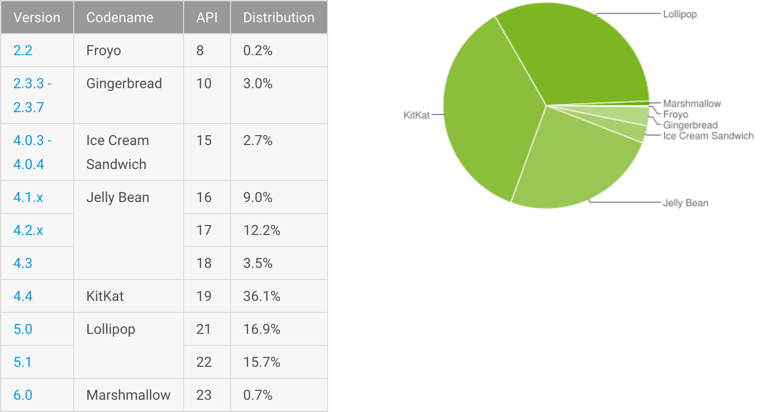 We're in 2016 already, but KitKat, introduced in September 2013, is still the most popular system version with a whopping 36.1%. Two most recent versions, Lollipop and Marshmallow, are represented by a total of just above 30% of devices. It means that as a developer, you should at least support users with Jelly Bean if you want to target 90% of the market. So what does it mean in terms of APIs you can use? We've done our best, but the ugly strikethrough is still there... Is there a better way? Sure there is! Luckily, the Android team has provided a bunch of classes, usually postfixed with "Compat", that are safe to call on most Android versions, and that hide away all the backwards compatibility mechanics. Below you'll find a quick survey of the most interesting, and probably the most helpful Compat classes that can be found in the compatibility library. Same story as with getColor(), the old method in Resources has been deprecated and replaced with a new one that requires a Theme argument. Just use the ContextCompat version and forget the trouble. There were no runtime permissions before Android Marshmallow, so when called on an older system version, this method will return PackageManager.PERMISSION_GRANTED for any permission declared in Manifest. Those look quite similar to the methods in ContextCompat, but allow you to provide the Theme argument yourself. I've never stumbled upon a use-case for any of these methods, so can't really say how helpful they are. Another odd detail is that getDrawable() and getDrawableForDensity() are static methods, while getColor() is an instance method. We've already seen the checkSelfPermission() from ContextCompat, and this method is another part of the runtime permissions compatibility implementation. On Android versions prior to Marshmallow it will automatically grant the permission if it has been declared in the Manifest. Unfortunately, the animations themselves haven't been ported to pre-JB, so those methods will have no effect on older system versions. This will result in setTint() being called on Drawable on Lollipop and higher, and will fall back to setColorFilter() on older versions. ViewCompat has a lot of wrappers to View class methods, introduced in Android Honeycomb and later, such as getX(), setX(), getY(), setY(), getAlpha(), setAlpha() and many more. Be careful though, most of the setters are just no-ops, and most getters return default values. It's worth mentioning that there are two classes called ActionProvider, the android.view.ActionProvider and the android.support.v4.view.ActionProvider. Make sure you use the latter with MenuItemCompat. NotificationCompat contains quite a handful of inner classes that help you create highly customized notifications. First use NotificationCompat.Builder to provide basic content for a notification, then initialize one of the implementations of NotificationCompat.Style, such as NotificationCompat.BigPictureStyle or NotificationCompat.BigTextStyle and pass it to NotificationCompat.Builder via setStyle(). There's an Android Training lesson that describes the process of creating custom notifications in more detail. As you probably know, the default behavior of AsyncTask changed twice throughout the history of Android: it used serial execution (all tasks inside the application were executed on a single worker thread) in the beginning, then starting with Donut it switched to parallel execution, only to jump back to serial on Honeycomb. If you'd like to run your tasks in parallel on newer Android versions, use executeParallel(), or just call executeOnExecutor() instead of execute() directly on AsyncTask, passing in AsyncTask.THREAD_POOL_EXECUTOR as the parameter. This was just a small selection from the complete collection of Compat classes, available in Android compatibility libraries, but those are probably the most used ones. But the rule of thumb is, when you stumble upon a deprecated method in the Android SDK - first dive into the docs for an explanation, and then look for relevant classes with Compat postfix! This is a pretty good way to stay on the safe side when dealing with backwards compatibility on Android. Cheers! In case you feel the list above is missing a class or two that you often use - please comment below, I'd love to hear about it!